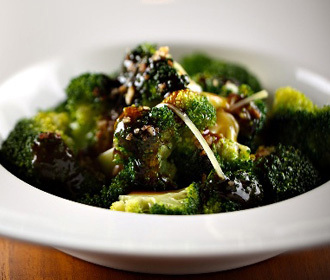 Delicious and healthy Chinese broccoli pan fried smothered in oyster sauce. Fresh cut slices of cleaned Chinese Brocoli, and chopped fresh garlic, Stir-Fried at over 500°F on a Stationary Extra Large Wok with various Chinese and Thai premium sauces cooked then reduced into a rich tastful dark brown sauce. Served with a small cup of gourmet Steamed premium Jasmine Rice.